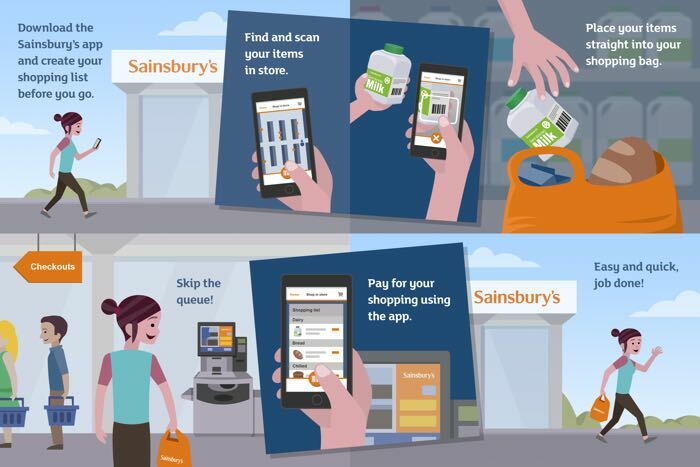 UK supermarket Sainsburys’ has announced a new mobile app that the company hopes will put and end to queuing at the tills when you go shopping at their supermarkets. This new mobile app from Sainsbury’s will allow you add items to you basket before you reach the store, once at the store, you are then directed around the aisles to find your items. The app will also allow you to scan items with your smartphone, and then you can pay for your shopping with your mobile phone, and walk out of the supermarket, without having to go through a till. Jon Rudoe, Digital and Technology Director at Sainsbury’s, said:”We know that customers’ weekly shop doesn’t start at our front door – they know what they like and they also like that search for a bargain. “They still want to come into store – but with limited time, they want to be able to get their shop done quickly. The company will be trialling the application at a number of their stores in the next few weeks, it will then be made available to their customers who are part of their Nectar card loyalty program in early 2015, you can find out more details at the link below.